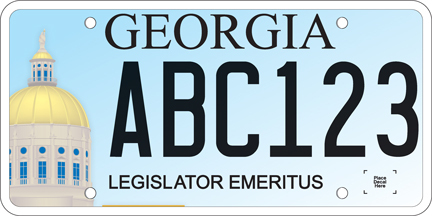 Required documentation: In order to qualify, an individual must be a former Georgia legislator who served in the Georgia legislature for 8 or more years. … OCGA 40-2-62 (as amended by SB 121). You must provide a legible copy of the Certification from the local board of elections, Resolution from the Georgia House or Senate,verification from documentation published by the General Assembly (such as composites or info from past sessions posted on the website).